Who makes the playoffs in the West this year? Vote for your top 8 and list your standings below. Didin't see Timberpups, but I wanted to put them over Jazz without Hayward tbh. Only voted for 7 because I have the Wolves making it this year. Geeze, Harden and CP3 on the same team. Someone needs to start a poll on how many flops or free throws they will end up with at the end of the season. Or even if you think the league will step up and fine one of them at some point. BTW, I put Rockets #1 just because of the number of games the Warriors have been playing and they may actually go a little on cruise control this year. But they still win another championship. Last edited by MavzMan; 08-29-2017 at 09:06 AM. 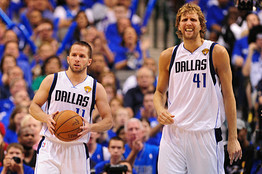 The West is so trash, the Mavs probably have a feeling they can make the playoffs. Technically they can. Seeds 5-10 are only separated by 4 games.